At the exposure time comet Lynn was 5.4° above the western horizon with the full moon rising at the opposite side and the sun 12.6° below the horizon. Full field of view (12' x 18'). 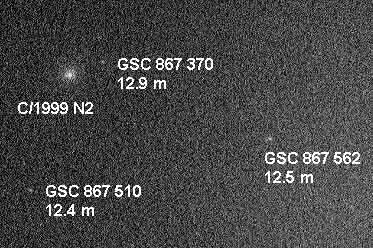 Last image was made with the comet 3.5° above the horizon and no stars visible in the CCD frame.